New discovery could enable development of vaccine and other drugs to combat VEEV. 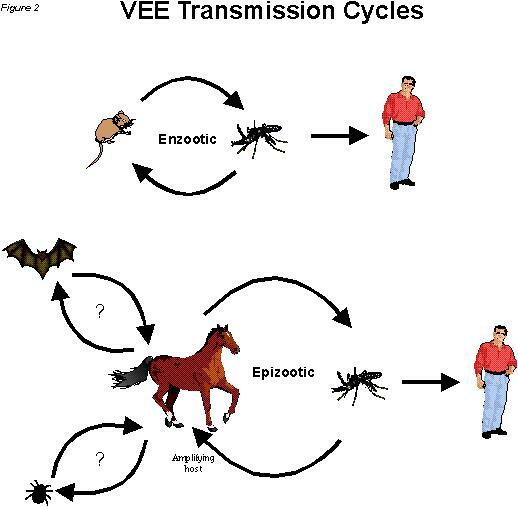 Venezuelan equine encephalitis virus (VEEV) is an unforgiving killer of horses, donkeys and zebras that results in mortality as high as 80% of infected animals. It causes rapid, catastrophic swelling of the brain and spinal cord, leading to severe neurological symptoms and, in many cases, sudden death. The virus also can infect people, with similar results. According to the Centers for Disease for Disease Control & Prevention (CDC), there are about six human cases of VEEV a year in the U.S., with a mortality of about 33%. The U.S. and Soviet Union both weaponized VEEV during the Cold War, prompting CDC and the National Institutes of Health to classify VEEV as a category B pathogen. A research team led by the University of Maryland has exploited a weakness in VEEV’s genetic code, resulting in a far less deadly mutant version of the virus when tested in laboratory mice. The new discovery could enable the development of a vaccine and other drugs to combat VEEV. The findings were published online Nov. 16 in the Journal of Virology. Like many other dangerous viruses, VEEV has RNA as its genetic material instead of DNA. Because a similar weakness exists in RNA viruses that pose serious health risks to people — such as HIV, Zika, chikungunya and others — the discovery could advance the development of treatments for these viruses as well, the announcement said. Dinman and his colleagues exploited a mechanism known as programmed ribosomal frameshifting (PRF), which allows RNA viruses to pack a larger amount of genetic information into a relatively short sequence of RNA. By prompting an infected cell to read the same sequence of RNA in two different phases, PRF allows a virus to create two different proteins instead of one. The researchers created a mutant version of VEEV with a disrupted PRF mechanism, which impaired the virus’ ability to create a second protein from a specific section of RNA. Tests in cultured cells did not reveal a large difference in the rate of virus production, but when the researchers tested the mutant virus in laboratory mice, they saw a dramatic increase in the rate at which infected mice survived the disease. In addition to a higher survival rate of mice infected with mutant VEEV, the researchers also noted a lower incidence of the virus accumulating in brain tissues. Dinman, Kendra and their co-authors suspect that the missing protein in the mutant virus plays a role in the virus’s ability to cross the blood-brain barrier — an essential step to cause brain swelling. According to Dinman, the finding is particularly encouraging in light of the challenge posed by climate change, as viral diseases begin to extend their range north beyond the tropics.